It was a great idea, truly. I still think it can work. Just the sound of it rolls off your tongue and makes you crave the taste...or what you think it might taste like. What is it? Oh. My cupcake entry for the month. Secret ingredient? Coffee. The cupcake? 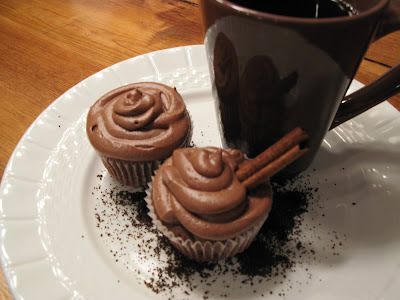 Cinna-mocha Chocolate Fudge Brownie Cupcakes. Makes your mouth water, huh? I told ya. Thing is, I flunked the recipe design part. It was a great idea, but the end product just didn't do what I wanted. Now, they are purty, but the cake was too dry and I had too much cinnamon -- the flavors were fighting each other. So, back to the drawing board for this recipe and perhaps I'll be able to enter again next month. If they will still have me? But here you go. Even though the cake part wasn't wonderful ( but oh, the frosting was heavenly!) the picture turned out not too bad. Um...could I just eat the frosting off a couple of them? Unless, of course, you want me to take the whole dozen off your hands. I could help you out there. Aww Maddie. So sorry they didn't turn out the way you had anticipated. They do look scrumptious though. I saw cupcakes, I saw thick, layered-on chocolate and had to come see if you were giving out freebies. Sorry the recipe didn't work magic this time. They do look good! They look good at least. Sounded good too. Sorry they didn't taste as good as you hoped. I'd be happy to just eat the icing directly out of the bowl, so it wasn't a total failure!!!!! By the way... if you haven't been down to RiRa's, the new Irish Pub on Fourth Street, you should. Onion rings TO DIE FOR! And you know how I am about onion rings! Good moring, ladies. I'm still going to work on this recipe. The frosting was to die for, so it stays a keeper. It was made with butter, cocoa, brewed cinnamon coffee and a little vanilla. The cake recipe was not as fudgy as I would have liked, so I didn't want to publish that one for the contest. However, I did freeze all of the cupcakes so one of these days y'all will just have to come over and we can just lick the frosting off of 'em. Okay?